Pablo Picasso’s sheet metal and wire "Guitar" from 1914, is one of 140 sculptures from his entire career is shown during the Museum of Modern Art (MoMA) press preview, Sept. 9, 2015, in New York. New York's Museum of Modern Art is devoting an entire floor to the sculptures of Pablo Picasso in the first major U.S. museum survey of his three-dimensional work in nearly 50 years. From his earliest piece, a tiny terra cotta of a seated woman created in 1902, to a head of a woman made in 1964, "Picasso Sculpture'' features more than 140 works on loan from private and public collections that showcase the scope, range and variety of his sculptures. 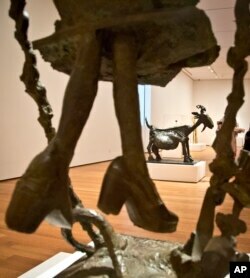 They include his bronze "She-Goat'' from 1950 and sheet metal and wire "Guitar'' from 1914 from MoMA's own collection. MoMA will be the only U.S. venue to host the exhibition, which opens Sept. 14 and runs through Feb. 7. Pablo Picasso’s "She-Goat" from 1950, right, at the Museum of Modern Art (MoMA) press preview, Sept. 9, 2015, in New York. The Spanish artist was trained in painting, not sculpting. This allowed him to be "extremely free in thinking about what is a sculpture,'' said Ann Temkin, co-curator of the show. "The degree of invention in terms of material and techniques that he used introduced brand-new ideas that had not been involved in the making of sculpture'' before," she said. His "revolutionary'' approach had an enormous impact on other artists, she added. Picasso, who died in 1973, viewed his sculptures as companions, keeping them in his possession during his lifetime. This partly explains why his 3-D works are less known than his paintings. Picasso created about 700 sculptures - compared with some 4,300 paintings. He made them in phases, sometimes with breaks of several years. Each time he resumed, he would begin with an entirely new set of materials and techniques. Arranged chronologically, his exhibit begins when the artist was 20 and made more traditional sculptures - modeled pieces in clay or plaster and then cast in bronze, pieces that look "more like the work of someone like Rodin,'' Temkin said. He quickly moved on and started carving in wood after becoming aware of African and Oceanic art. During his cubist phase, he created sculptures from lumber scraps, cardboard, tin cans and other materials. "That was absolutely brand new,'' Temkin said, citing his "Glass of Absinthe,'' an edition of six identical bronze sculptures each hand-painted in a different pattern and incorporating a silver spoon and sugar cube. Then, after about a decade of not making any sculptures, Picasso entered the surrealist phase - a burst of creativity that again "results in new shapes, new forms, new material,'' said Anne Umland, who organized the exhibition with Temkin. This was a new approach in terms of working with welding, the curators said. He also worked with assemblage, using found objects as in his "A Head of a Warrior,'' whose eyeballs are made of tennis balls from Picasso's tennis court. A Paris exhibition in 1966 first introduced the public to his work in the medium. The following year, MoMA presented "The Sculpture of Picasso,'' the first survey of his sculptures in North America. "Picasso Sculpture'' is presented in collaboration with the Musee national Picasso-Paris, which lent 40 pieces for the exhibition.